Starting at $24.95/month, fully managed virtual desktops from Apps4Rent come with a choice of virtualization technologies from Citrix and Microsoft; look and feel of Windows 10, Windows 8, or Windows 7; session-based with fixed applications or dedicated with self-installation of applications; option to install Office 365; option for GPU acceleration; secure and reliable infrastructure; daily backups; and 24/7 support by phone, email, and chat. Our service is backed by our extensive experience in hosting critical business software applications in the Cloud for over 10,000 clients in more than 50 countries. If your employees need access to their familiar Windows desktop and applications from anywhere on any device, then virtual desktops from Apps4Rent are a perfect fit for your organization. For advanced security and reliability, we also offer services to help you host Virtual Desktops on Microsoft’s Azure cloud. Take a 15-day risk-free trial now! Access your favorite applications from anywhere anytime. Install custom apps on a Virtual Desktop. Pay on a month-to-month basis without signing any contract. Add/remove users anytime based on your requirement. Access Virtual Desktop via browser on PCs/Macs, laptops, Android/iOS devices, notebooks, tablets, slates, or smartphones. Save money on hardware costs by making your existing PCs/laptops works as good as latest devices. Free your internal servers and physical infrastructure. Don’t worry about software updates and support required to maintain the desktops. Be secure with SSAE-16 top-tier data centers located in New York with highest standards of security and redundancy. Get the 99.9% uptime guarantee with redundancy across power supply. Be relieved with our 24/7 monitoring of infrastructure. Data is backed up daily in state-of-art data centers. The well-defined processes ensure complete data restoration in case of disaster recovery. Why Apps4Rent for Virtual Desktops? Our widespread recognition as a provider of cloud-hosted virtual technologies is built on customer trust, 10000+ of them over 50 countries. 13 years into this business, we have supported them in every hosting related issues they have faced; through our 24x7x365 technical team comprised of Microsoft Certified Professionals. Today, we are a name to reckon with in the hosting services market. We are a Microsoft Cloud Solution Provider as well as Gold Certified Partner. From helping you install printer drivers or various other devices on these desktops to designing the right solution for your desktop needs-our support team will do it all. Unlike other providers who may trick you to purchase separate desktops for each user, we do not ask you to purchase separate desktops for separate users. You could always add additional users to your current virtual desktop with our offering. This can reduce your costs by more than 50%. Add to that, our plans are priced at just $24.95/month, the lowest in the market. Unlike other vendors who use proprietary technology to give you access to desktops via different methods, we use Microsoft’s built-in Remote Desktop Protocol (RDP). In many cases, proprietary applications may not be available for all platforms. This method restricts your choice of devices by which you can access the virtual desktops with issues ranging from applications not working in certain devices and OS to limited functionalities. To make your experience easy and rewarding we do not use any third party proprietary technology. Our virtual desktop plans are carefully designed and tailored to your usage needs. Unlike other providers that offer licenses in bulk, we let you ‘pay as you go’. You can increase or reduce the number of licenses as per your usage, without having to preempt your future usage requirements and paying for bulk, upfront. If you are not satisfied with our service, we provide you the option to cancel licenses anytime. 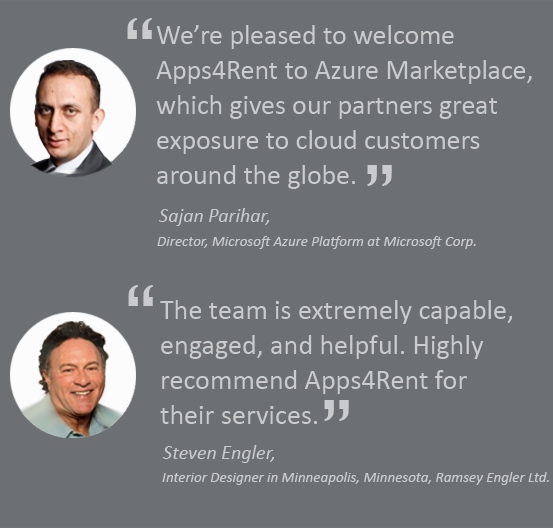 Still need more reasons why you should buy from Apps4Rent? We provide the widest choice of hosting solutions. We put customers’ data security at the top of our priorities. We have exemplary service delivery model that ensures ‘zero error’. We focus on customer centricity – we obsess over the term ‘customer satisfaction’. We are experienced in providing a variety of Microsoft products in the Cloud. We can help you develop custom virtualized environments for your needs. Choose Windows 10, Windows 8 or Windows 7 look and feel. For self-installation of applications, pick a dedicated virtual desktop plan. Add Office 365 ProPlus for a low price. Access your virtual desktop through RDP which is included in Windows OS. RDP equivalents are available for Macs. Or just use an internet browser on your favorite device. Save as much as 40% for add-on users on your virtual desktop!